New results from WWF’s “One in Five Challenge”, a programme to help organisations cut 20% of flights within 5 years in favour of lower-carbon ways of staying connected, show that some of the UK’s leading companies have cut flights by 38% and flight expenditure by 42% over a 3-year period, saving them over £2 million and over 3,000 tonnes of carbon. Organisations that have achieved the One in Five Challenge, include BskyB, BT, Capgemini, Lloyds TSB, Microsoft UK, the Scottish Government, the Scottish Environment Protection Agency (SEPA) and Vodafone. The Challenge has helped companies to make significant inroads into cutting their costs and carbon from business travel and to change their business travel behaviour in favour of alternatives such as rail and video-conferencing. These results, together with other WWF-UK analysis which shows a significant, long-term decline in business flying in the UK, point to a permanent change in meeting and travel practices, questioning the business case for UK airport expansion. Having developed the One in Five Challenge and run it successfully for over 4 years, WWF is handing “One in Five” to Global Action Plan (GAP), the UK’s leading environmental behaviour change charity helping business to reduce environmental impact. New results published today from WWF’s One in Five Challenge, a programme to help organisations cut 20% of flights within five years in favour of lower-carbon ways of staying connected, show that some of the UK’s leading companies have cut flights by 38% and flight expenditure by 42% over a three-year period, saving over £2 million and 3,000 tonnes of carbon on average. Organisations that have achieved the One in Five Challenge, including BskyB, BT, Capgemini, Lloyds TSB, Microsoft UK, the Scottish Government, the Scottish Environment Protection Agency (SEPA) and Vodafone, have cut far more flights, more quickly than anticipated. Reduce their emissions by 32,000 tonnes of CO2. The Challenge has therefore helped companies to make significant inroads into cutting their costs and carbon from business travel and to change their business travel behaviour in favour of alternatives such as rail and videoconferencing. These results, together with other WWF-UK analysis which shows a significant, long-term decline in business flying in the UK, point to a permanent change in meeting and travel practices, questioning the business case for UK airport expansion. A review system that acknowledges the achievements of staff in reducing business flights. Having developed the One in Five Challenge and run it successfully for over four years, WWF-UK is now handing over management of this programme to Global Action Plan (GAP), the UK’s leading environmental behaviour change charity helping business to reduce its impact on the environment. A WWF initiative to help 12 leading organisations reduce their businessflights has helped participants save an average of over £2m over three years. BT, Microsoft, BskyB and the Scottish Government are among the members of the campaign group’s One in Five Challenge, which commits participants to cutting business flights by a fifth over five years. Other members of the group include Marks & Spencer, the Scottish Environment Protection Agency (SEPA), Skanska, Vodafone, Capgemini, Lloyds TSB, and Balfour Beatty. WWF’s latest report shows the group’s members have on average cut flights by 38 per cent and flight expenditure by 42 per cent, avoiding 3,000 tonnes of CO2 in the process. Moreover, organisations maintained reductions through each year of the programme even through cuts become steadily more difficult after the first year when the obvious changes are made. Savings after the first year of the scheme totalled £14m across 10 participants, while in the third year seven companies shared £15m worth of savings and in the fourth year six companies recouped £13m. Since the challenge was launched in 2009, participants have cut out 141,000 flights, travelling around 113 million fewer kilometres – equivalent to around 150 return trips to the moon. 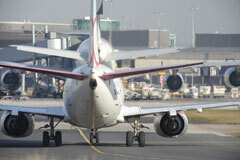 In doing so, they have saved a total of £26m in avoided flight costs and reduced emissions by 32,000 tonnes of CO2. In addition, they are said to have realised some unexpected benefits, such as productivity gains from increased collaboration, faster decision making, and less time spent out of the office. WWF said the methods used to reduce flights varied among the participants, indicating that the organisations use measures that work most effectively for their circumstances. Some of the policies used include undertaking staff engagement programmes to set travel targets and question the need for corporate trips, as well as introducing requirements for corporate carbon reporting, increasing the use of remote conferencing, and replacing flights with rail travel. David Nussbaum, chief executive of WWF-UK, said the results showed that companies profit from flying less. The trends seen in the report echo the bigger trend which has seen a drop in business air travel as communication technology becomes more advanced. Figures published by the Civil Aviation Authority show business flying to and from Heathrow has fallen 23 per cent since 2000, while Office for National Statistics data indicates across the UK business air trips have fallen 13 per cent – a decline that began well before talk of a “capacity crunch” at UK airports and several years prior to the recession. In 2012, just 16 per cent of UK flights were taken for business purposes, compared to 22 per cent in 1998. A 2011 WWF survey found 80 per cent of FTSE 500 companies are saving money from avoided flights and associated expenses and that only one in seven of the companies that have reduced their flights intend to return to their previous levels of flying. Meanwhile, video conferencing users are expected to soar from 36 million in 2011 to 219 million in 2016, according to figures from networking giant Cisco. WWF argues these trends undermine the business case for a new runway at Heathrow, one of the preferred options of the ongoing Airports Commission review into airport capacity in the South East. Posted: Saturday, January 25th, 2014. Filed in General News, Recent News.